Over the next decade, Gibson hopped from city to city, serving as producer and deejay at various stations: WLOU-Louisville, WMBM-Miami, WCIN-Cincinnati, WABQ-Cleveland, and back to WERD in Atlanta where he began what was likely the first jazz program in the South. Several chapters of the book recount his exploits in these cities: covering the Civil Rights Movement, serving as a mediator between the police and the Black community, working with fellow deejays such as Tommy Smalls (aka “Dr. Jive, the “Mayor” of Harlem) and Eddie Castleberry, and “breaking” records for various artists and promoting their shows. Radio, however, could not contain Jack Gibson forever. A true renaissance man, he branched out into other facets of the industry, as detailed in chapters 13-17. In 1961, “he put his innovative mind to work and developed a new design for radio control rooms.” Later that year, Gibson transitioned to promotion manager at Motown Records, where he started the Soul imprint and accompanied Stevie Wonder, the Miracles, and the Supremes on tour, witnessing the latter group’s break-out performances at the Copacabana nightclub and on the Ed Sullivan Show. Gibson also did a short stint at LeBaron Taylor’s Revelot label in Detroit, then with Joe Medlin at Brunswick in New York, Curtis Mayfield’s Curtom label in Chicago, and from 1969-1972 he worked with his friend Al Bell at Stax Records in Memphis. During this period he also founded the National Association of Radio Announcers (NARA, and later NATRA), where he worked to improve conditions for African Americans in the radio and record industries. Chapter 19 tells the story behind the final stage of Gibson’s career. After semi-retiring in 1976, he launched the industry magazine Jack the Rapper, the oldest Black trade publication targeted to radio, which continued through 1997 (in later years known as Jack the Rapper’s Mellow Yello). Building upon this momentum, in June 1977 he organized “Jack the Rapper’s Family Affair,” a Black music convention “where generations of performers, radio and record executives came together to celebrate each other and the music of Black America.” For the next twenty years the annual Family Affair Convention, typically held in Atlanta, was a networking and resource mecca for the Black entertainment industry. Ironically, as rap music garnered a larger share of the music industry, many newcomers assumed that “Jack the Rapper’s Family Affair” convention was devoted to rap music. As this section of the book concludes, battles—some turning violent—between rival rappers attending the convention regrettably lead to its demise. 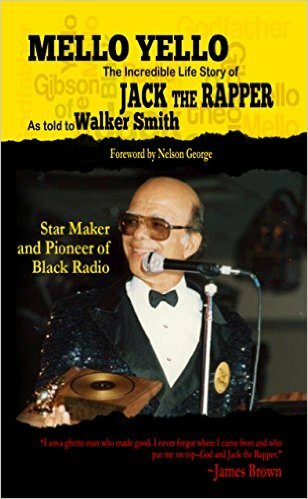 Walker Smith has done an excellent job of editing the interviews into a fitting tribute to Jack “The Rapper” Gibson—one of the foremost pioneers in Black radio and Black music, a man who mentored and promoted countless deejays and artists, and a national treasure who should receive much wider recognition. Editor’s note: Many of the images published in Mello Yello are from the Jack Gibson Collection at the Archives of African American Music and Culture (AAAMC). Photos from the Gibson collection can be viewed through Indiana University’s Image Collections Online; a video of a 1981 interview of Jack Gibson by Dr. Portia K. Maultsby was recently preserved by IU’s Media Digitization and Preservation Initiative and can be viewed here; Gibson is also featured prominently in the AAAMC’s new multi-media virtual exhibit, “The Golden Age of Black Radio,” available online at Google Cultural Institute. This entry was posted in African American Culture & History and tagged 2015, 2015 Books, Black radio, Book Review, Brenda Nelson-Strauss, Jack the Rapper, Mello Yello, Sonata Books, Walker Smith by aaamc. Bookmark the permalink.